Unregistered businesses can now accept online payments with Paystack as Paystack Starter Businesses. 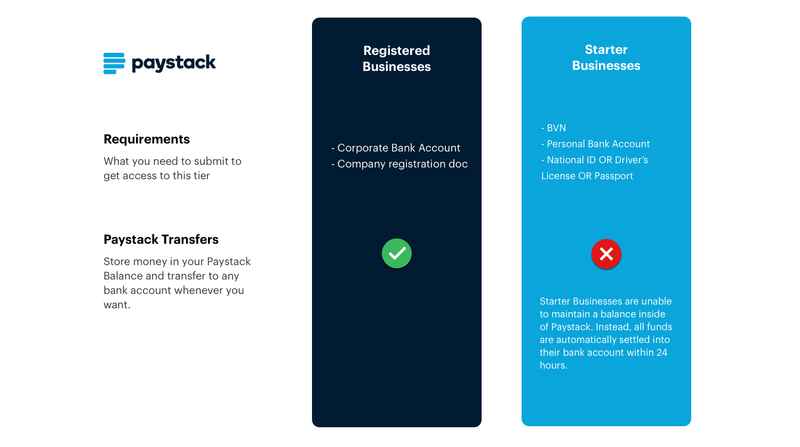 Starter Businesses do not need to submit a corporate bank account or certificate of incorporation to use Paystack. This merchant tier is intended for people who’re looking to validate their business ideas for a period of time with real customers. Unregistered businesses can now accept online payments with Paystack without a corporate bank account or company registration document! You no longer need a Company Registration or Corporate Bank Account. Starter Businesses have access to almost the same suite of powerful payment tools used by companies such as Domino’s Pizza, Taxify, Opera, Axa Mansard, Ikeja Electric, and over 8,000 of some of the best businesses in Nigeria. The main difference is that Starter Businesses have a 2 million Naira limit, after which they'll need to submit documentation to become Registered Businesses. Here’s a thorough breakdown of the difference. WARNING: The following section is a reeeeally deep dive, telling the story of the thinking behind Paystack Starter Businesses. Unless you’re the kind of person who enjoys hearing about the nitty-gritty blow by blow account of how startups make decisions, you’ll be bored out of your mind. One of the most popular feature requests we receive at Paystack is for unregistered businesses to be able to use Paystack without needing a corporate bank account or company registration document. We hear it so often that we actually came extremely close to launching this in Q4 2017, at the time called Personal Accounts. The benefits of launching Personal Accounts were obvious: many more people would be able to use Paystack. This would in turn grow our transaction volumes and take us closer to our internal milestone processing 10 billion Naira monthly. As we neared the launch, however, we realized that there’re a number of not-so-obvious complications of Personal Accounts. At Paystack we believe strongly that our mission is to help businesses in Africa become massively profitable, envied, and loved. But we genuinely aspire to be a growth engine for businesses. The way we do that today is through a kickass payment gateway, but we have our eyes set on providing an entire suite of tools to help businesses succeed in a global arena. Whether you’re an Instagram merchant or a large multinational, if you’re a business in Africa with dreams of growth, Paystack’s goal is to give you every unfair advantage you need to succeed. For this reason, we realized that it wasn't enough to enable merchants get started - we also needed to provide a path towards helping motivated merchants to be able to formalize their businesses with as little friction as possible. This is not out of any deep love for the process of registering companies, but because being a formally incorporated company is an important step towards becoming a globally-relevant business. We started to think of Paystack Starter Businesses as the first step of a business' growth story. First, you put the idea into the world, you validate it over time, then you mature into a fully formalized business. With this in mind, we reached out to partners like DIY Law, a legal startup, to help make the company formalization process as seamless as possible. The truth is that not everyone can afford to (or should!) jump toward company incorporation from day one. Imagine you’re in the early stages of your idea. You have a hunch that this idea could be big, but you need a way to validate it. There needs to be a way to quickly test the idea with real customers. The more we spoke to prospective merchants about why they needed the unregistered business option, the more we realized that this was where many of them were: at the very early stages of an idea that could become so much more, if the idea was given a chance to prove itself. These conversations helped us figure out which tools to make available to Starter Businesses. 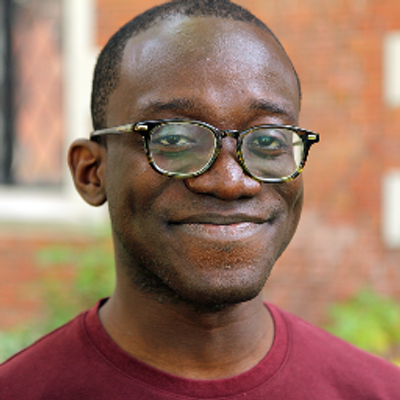 Instead of being overly restrictive in the tools Starter Businesses could have access to, we ultimately decided to make almost the entire Paystack suite available to Starter Businesses, giving them the same calibre of tools of much larger companies like Axa Mansard, Domino's Pizza, and Opera. This way, Starter Business have every opportunity to succeed. 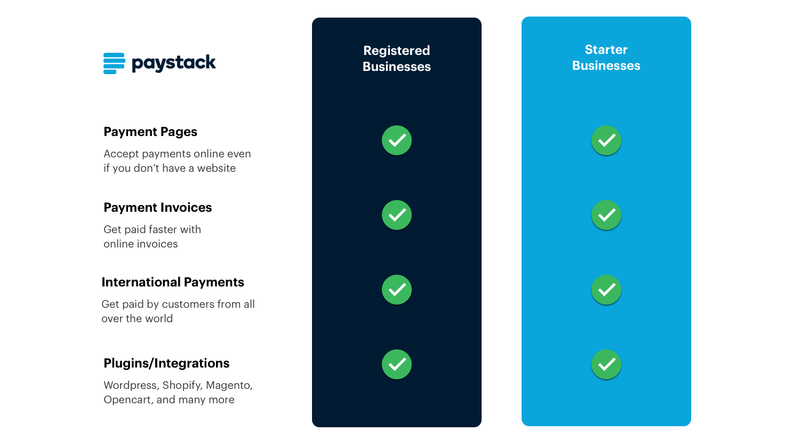 Paystack Starter Business have access to the same suite of high quality payment tools used by companies like Opera, Axa Mansard, and Domino's Pizza. There was one last set of conversations that clarified in our minds what our strategy should be for unregistered businesses - conversations with the customers of our merchants. We learned that for our merchants' customers, there’s an implicit promise of trust in the Paystack brand. Customers trust that when they’re paying a Paystack merchant, that merchant has been vetted. When we give a merchant the tools to accept payments from real customers, we signal to the customer that this merchant is honest and trust-worthy. From the customers’ perspective, if anything goes wrong, we’re as much to blame for giving the merchants those tools in the first place. In a low trust environment like Nigeria, where many people are making payment online for the first time, it’s absolutely critical that when people encounter online payments, their experience is as pleasant - and as fraud-free - as possible. This is a responsibility we take extremely seriously. We realized that we needed to balance the strong desire to open Paystack up to unregistered business against the equally strong obligation to protect the interests of customers. 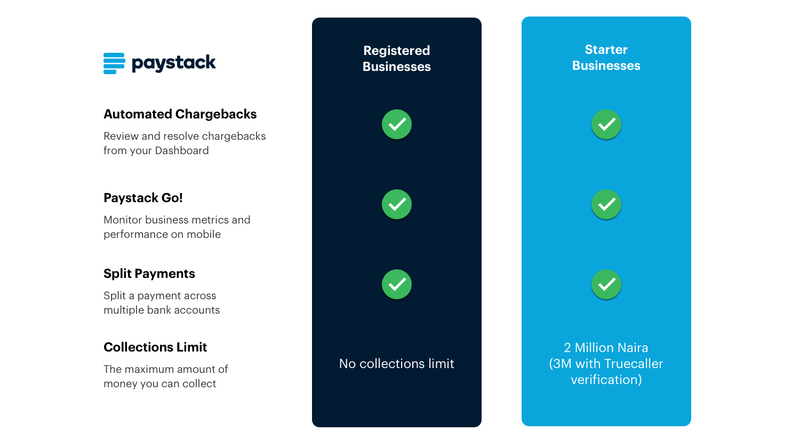 We significantly beefed up our automated anti-fraud systems, applied a maximum collections cap to Starter Businesses, and engaged partners like Truecaller, to make possible new tools to verify the identity of Paystack Starter Businesses. So these were some of the thoughts that swirled in our heads as we worked to articulate our approach to making Paystack available to unregistered businesses. 1. Make it easy for people with ideas to validate them with real customers: With only a BVN, a personal bank account, and a means of identification (passport, driver's license, or National ID), anyone with an idea can start validating their ideas quickly. 2. 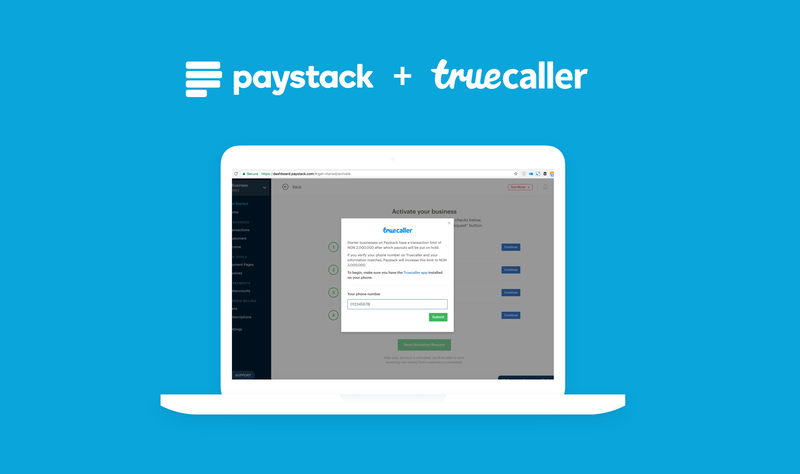 Protect the end-customer from fraudsters: We beefed up our fraud rules, limited the total amount that Starter Businesses can collect, and even partnered with our friends at Truecaller to verify the identities of Starter Business merchant. 3. Help make the incorporation process as easy as possible: We’ve partnered with our friends at DIY Law to provide subsidized incorporation services, so that Paystack merchants who have validated their ideas and are ready to incorporate can do so as painlessly as possible. We’re also working with our banking partners to make the corporate bank account creation process also seamless. More news on this soon! We recognize that the way we’re thinking about Starter Businesses might not be the right fit for everyone who needs a way to accept payment online. If you never intend to eventually register your business at all, for example, you’ll be frustrated by the 2 million Naira cap. To be very honest, we’re really nervous about this. This is one of the most opinionated product decisions we’ve ever made, and we did it knowing that the consequence of this decision is that some merchants will opt for alternate payment gateways. And we accept this. 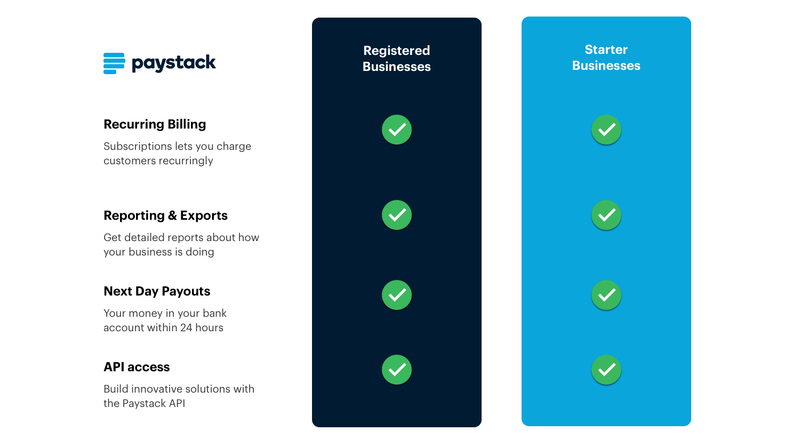 With Paystack Starter Businesses, we're able to support merchants from every stage of their growth story - from when an entrepreneur first has an idea, through those exciting early signs of success, and all the way to when they formalize the business. Paystack has maintained a merchant-first focus since the very beginning of the company. We believe strongly that this laser focus on growth-minded businesses allows us to deliver the best quality products and services to the merchants who share the same dream we do: a tribe of thousands of the best businesses on the continent, united by the goal of becoming profitable, envied, and loved. If you have any questions about Starter Businesses, our friendly Customer Success Experts are on standby to help! Shoot us an email at [email protected], send us a Direct Message on Twitter, or give us a call at +234 1631 6160! We've introduced new improvements to Paystack Payment Pages!